A portrait of former astronaut Leroy Chiao, who commanded the International Space Station during his 15-year NASA career. Leroy Chiao is a former NASA astronaut and commander of the International Space Station. During his 15-year flying career, he performed six spacewalks. Chiao is the special adviser for human spaceflight to the Space Foundation, and holds appointments at Baylor College of Medicine and Rice University. Chiao contributed this Op-Ed to Space.com's Expert Voices: Op-Ed and Insights. On April 9th, the U.S. Senate Committee on Commerce, Science and Transportation, Subcommittee on Science and Space, held a hearing on U.S. investment in human spaceflight entitled "From Here to Mars." 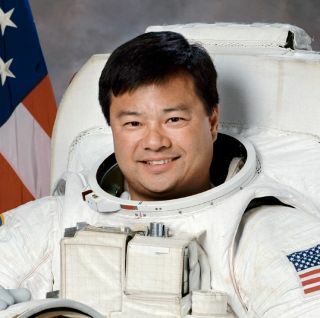 Leroy Chiao, Space.com columnist and NASA Astronaut Commander of International Space Station Expedition 10, testified on the critical need for American leadership in human spaceflight — and the equally critical need for strong political commitment to a continued U.S. investment in space. Below is his testimony from the hearing. Testimony of: Leroy Chiao, Ph.D.
Chairman Nelson, Ranking Member Cruz, and Members of the Subcommittee, thank you for your service to our nation, and thank you for the opportunity to present my views on the future of U.S. human spaceflight (HSF). The U.S. HSF program drives technology development by employing our citizens to advance the state of the art in several fields. Many of these technologies are adapted to purposes, which improve the quality of life for people on the Earth. These are very good reasons for our nation to maintain a robust HSF program. But I believe the biggest return on our investment is national prestige, and inspiration of the next generation, as called out in the mission statement of the Space Foundation: "To advance space-related endeavors to inspire, enable and propel humanity." HSF has become woven into the very fabric of our identity, as a nation of explorers, innovators and entrepreneurs. It was exactly the endeavors of the Apollo and prior HSF programs that inspired me, and my generation. We must do the same and more for our children and grandchildren, and to help maintain our position as the world leader. I served as a member of the 2009 Review of U.S. Human Spaceflight Plans Committee. The committee addressed both Low Earth Orbit (LEO) and Beyond-LEO (B-LEO) exploration, and presented options to the administration. The current space policy is based upon major elements of one of the options presented in the committee report. However, the main and most important message of the committee and report was that in any case, the chosen HSF program must be robustly supported, both politically and financially. Strong, bipartisan leadership is needed to sustain programs across administrations. Otherwise, election-cycle changes cause confusion and waste. If credible B-LEO exploration was to be a part of the HSF program, the committee estimated that the 2010 NASA budget would have needed to be increased by three billion dollars, and that the buying power of this budget would need to be sustained in follow-on years. The implied message was that if the budget could not be increased to this level, then the United States should continue to operate the Space Shuttle and International Space Station (ISS) and delay significant work towards a B-LEO program. Unfortunately, this has not been realized, and NASA has been directed to attempt to plan a credible B-LEO program within the framework of what has essentially been a flat budget, in terms of buying power. The challenge of this cannot be overstated. This is why we have seen changing proposals of the first destination and mission over the last several years, settling recently on an asteroid-redirect mission, with the first B-LEO astronaut flight planned for 2021. During that mission, the crew is to fly in formation with the redirected asteroid in Earth-Lunar orbit. But the plans for even these modest goals within the schedule allow for practically no cost overruns. This calls the credibility of the plan into question. Thus, the first step to plan "from here to Mars" is to ensure that the budget is sufficient to support the program. The realistic, sustainable funding level for B-LEO should be determined, and then the program scoped accordingly. If we cannot adequately support a credible B-LEO program politically and financially, then we should not attempt it. The ISS defines the current LEO HSF program. It serves not only as a common point for the international partner community, but also is a critical part of the development of the B-LEO HSF program. The most challenging technical aspect of the B-LEO program is biomedical: How to maintain the health of astronauts during long-duration flight, both inside and beyond the Earth’s magnetosphere. Research aboard ISS is critical to the development of operational medical countermeasures to ensure astronaut health during these demanding missions. Created and enabled by NASA at the recommendation of the National Academies, the National Space Biomedical Research Institute (NSBRI) has formed a consortium of the finest biomedical research universities and institutes in the United States, and funds targeted, applied research to develop countermeasures to enable B-LEO flights. This work maps to, and adds unique value to NASA’s Human Research Program (HRP). NSBRI also led to the creation of the Center for Space Medicine (CSM) at the Baylor College of Medicine. CSM complements government-funded research, both in space and Earth applications. ISS is currently scheduled for decommissioning in 2024, although studies indicate that it can be safely operated through at least 2028. ISS life should be extended to at least 2028, and beyond if practical, in order to adequately support the development of necessary technologies and countermeasures for the B-LEO HSF program. Similarly, NSBRI will reach its twenty-year contract life in 2017. It should be renewed, to ensure no loss of continuity in countermeasure development. Commercial flight to LEO is a logical evolution. NASA developed the technologies for flights to and from LEO, and should now focus on B-LEO goals, rather than LEO transportation. The commercial companies currently receiving NASA support have shown impressive progress with multiple cargo deliveries to the ISS, and progress towards crew transportation capabilities to ISS. These efforts should continue to receive full support, so that the U.S. can regain the capability to launch astronauts to ISS in the next few years. This commercial effort does not conflict with NASA’s B-LEO exploration program. In fact, it helps to enable B-LEO missions, by supporting important, critical-path research and hardware test bed projects aboard ISS. A sustainable B-LEO program requires a heavy-lift launcher. The Space Launch System (SLS) is an essential part of the long-term program. However, the current budget does not support a reasonable plan, timeline or complement of missions. The optimistic schedule calls for a flight rate of only 0.75 times per year once operational, possibly in 2021, and only if development proceeds as planned with no schedule slip or decrease in budget. If the budget cannot be increased to accelerate this development and support a higher flight rate, then the U.S. should consider slowing, or delaying SLS development. It is important to have a build-up flight test plan with a meaningful and consistent flight rate during development of a B-LEO program. This is to develop both ground and flight operations, and to maintain team proficiency. If the national budget cannot be increased to support such a plan and flight rate for SLS/Orion missions in the next few years, alternatives should be considered. If one thinks of SLS/Orion as analogous to Apollo/Saturn flights, an appealing alternative is an analogy to the Gemini program. The Multi-Purpose Crew Vehicle (MPCV, Orion) is currently being built, with the first flight test (without crew) scheduled for late 2014. The configuration for this first Exploration Flight Test (EFT-1) includes the use of an existing launch vehicle and upper stage. A similar configuration could be human rated, and be used in a series of meaningful test and development missions. Such a build-up flight test program using this configuration could be planned to thoroughly test Orion systems, develop rendezvous and docking operations, and include first destinations B-LEO. These latter flights would build up flight experience beyond the Earth’s magnetosphere to develop operations, to characterize the environment, and to test biomedical countermeasures. These flights would pave the way for the more-ambitious SLS/Orion missions. SLS will enable robust B-LEO missions, which should include the development of a crew-tended base on the Moon. This base would be used as a test bed for hardware and operations development for eventual HSF flights to the Martian surface. While it would be technically possible to bypass the Moon on the way to Mars, I believe it would be imprudent and add risk. The importance of thorough ground and build-up flight tests to ensure program success is clear, has been demonstrated many times, and cannot be overstated. One of the principal findings of the 2009 committee was that "The U.S. can lead a bold new international effort in the human exploration of space." Having common, very visible international civil projects generally lead to better relationships between the partner countries, and provides the potential for overall cost savings. The ISS program is an example of such a project, and future HSF programs should expand on this international model. Currently, and for nearly three years, the only entities able to launch humans into space are Russia and China. Thus, China is an obvious addition to the international HSF partnership, both for the ISS program and beyond. China has successfully demonstrated rendezvous and docking capabilities, extravehicular activity (EVA) and operation of a crew-tended LEO space module. The Chinese have a long-term plan that includes construction of a space station in 2018, with full operational capability by 2022. China is in a position to provide hardware and capability in-kind. Security and technology transfer concerns would be handled exactly as the U.S. does today with Russia. To my knowledge, there have been no improper technology transfers, in either direction. America can and should be the clear world leader of international space exploration programs, both in LEO and beyond. What is needed is consistent and sustained, strong political and financial commitments from the White House and Congress. NASA requires the resources to create a robust, integrated, international exploration plan that will lead us into the next exciting phase of HSF. It does not have it today. Chiao's most recent Op-Ed was, "Sending Olympic Torch to Space, Russia Flaunts Inspiration Superiority (Op-Ed)." Follow all of the Expert Voices issues and debates — and become part of the discussion — on Facebook, Twitter and Google +. The views expressed are those of the author and do not necessarily reflect the views of the publisher. This version of the article was originally published on Space.com.